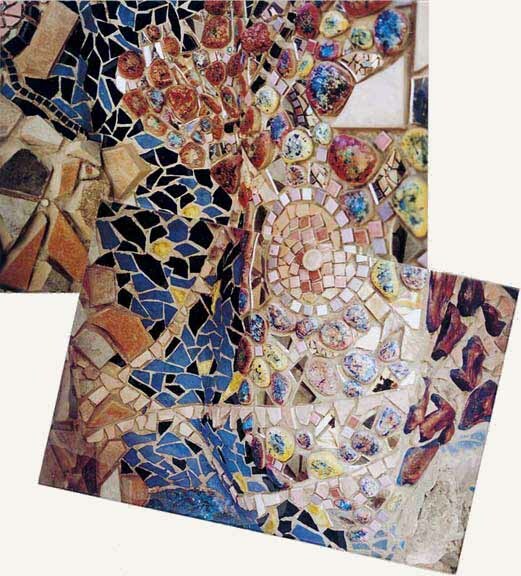 Pipe Dreams is Mike’s most recent building, and it’s an art gallery of his paintings, a labyrinth of a building with dozens of rooms, tableaus, displays of paintings, fabrics, tilework, stonework, stained-glass-colored beams of light reflecting on walls and floors. 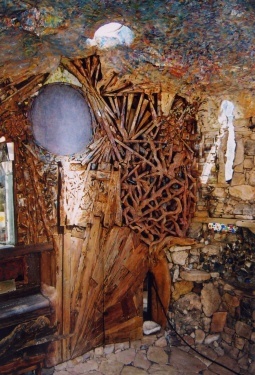 Mike’s friends David O’Keefe and Michael Glastonbury collaborated with him in the spontaneous creation and construction process. 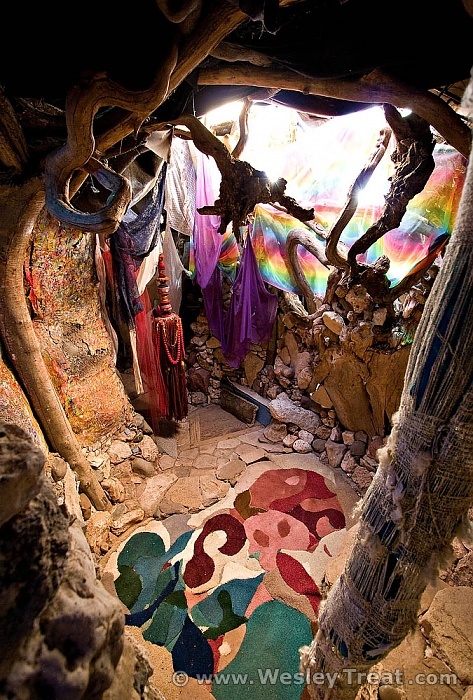 It’s not often that you can visit a magical psychedelic world without taking drugs, but Eliphante Village offers just that. 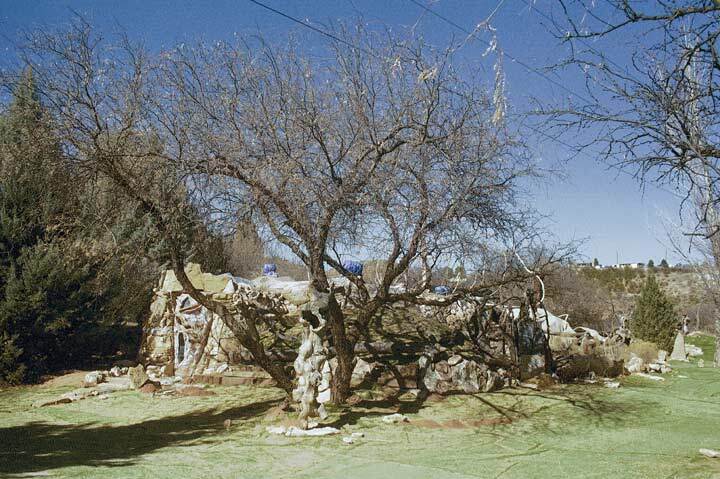 The strange art project began with a couple who were gifted three acres of land in Cornville, Arizona to do with as they please. 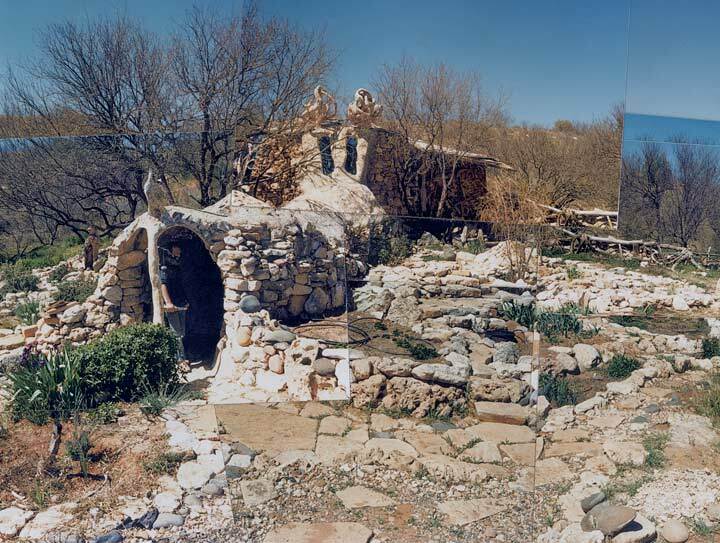 Back in 1979 Michael Kahn and his wife Leda built the first organic structures of what would become a village over decades of hard work and creativity. It’s a strangely surreal place that has to be seen to be believed. Eliphante is named after the first structure that was created which (slightly) resembles an elephant. 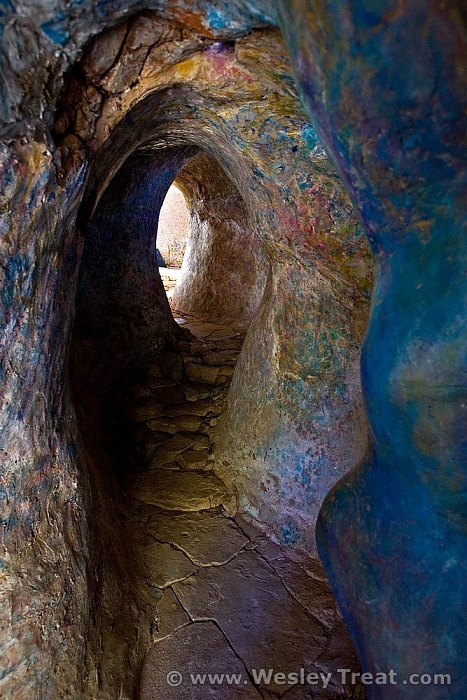 To get to the village you have to pull yourself across a stream, but once you’ve arrived you’ll be greeted by hundreds of art pieces, sculptures, displays, and secret passages. 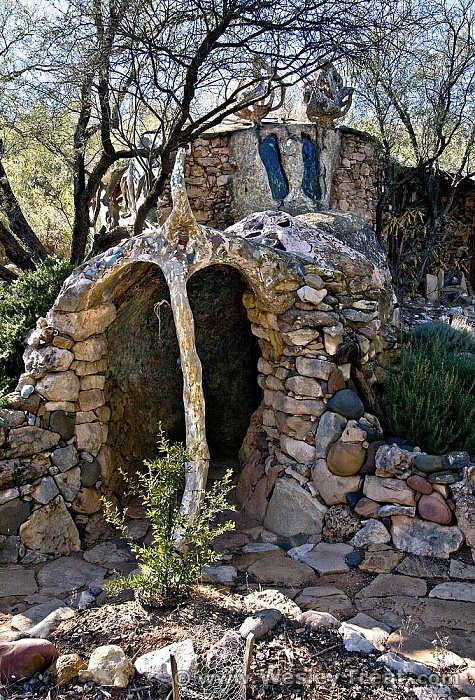 And all of it is built by hand, organically from rocks, branches, and whatever the couple could find lying around. The Kahns worked on the village for 28 years until Michael passed away in 2007, and his wife decided to pass on the torch. Today Eliphante Village has new volunteer caretakers working to restore the village from damage by harsh climate conditions and wild animals. They also throw parties once in awhile, which all members are invited to. The caretakers believe that they must be able to adapt to what nature provides, carrying on the legacy of Mr. Kahn. Article by Outspeak via The Huffington Post with courtesy to Danny “Special Head” Wolverton for video footage. 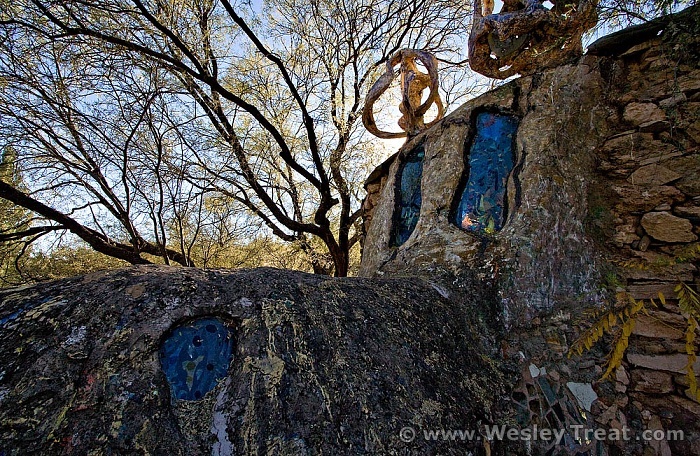 Beginning around 1979, and continuing for the better part of three decades, Michael and Leda Kahn created a magical folk art installation along the sycamore and mesquite-lined banks of Oak Creek in Cornville, Arizona. The entire complex is known as “Eliphante”, named after the first structure created, which resembles, with its ear-side doors and river wood snout, an elephant of sorts. Several buildings followed: the “Hippodome”, “Pipe Dreams”, smaller houses, outdoor kitchen, amphitheater and assorted art installations. 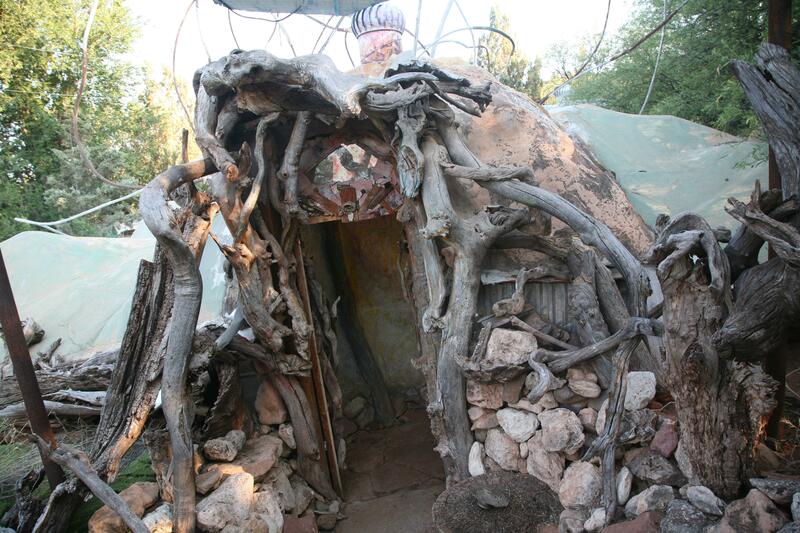 The structures and art spaces are all designed with native natural materials, sandstone, wood, salvaged glass, mylar, foil, tile and metal, and many years of creativity, love and hard work. 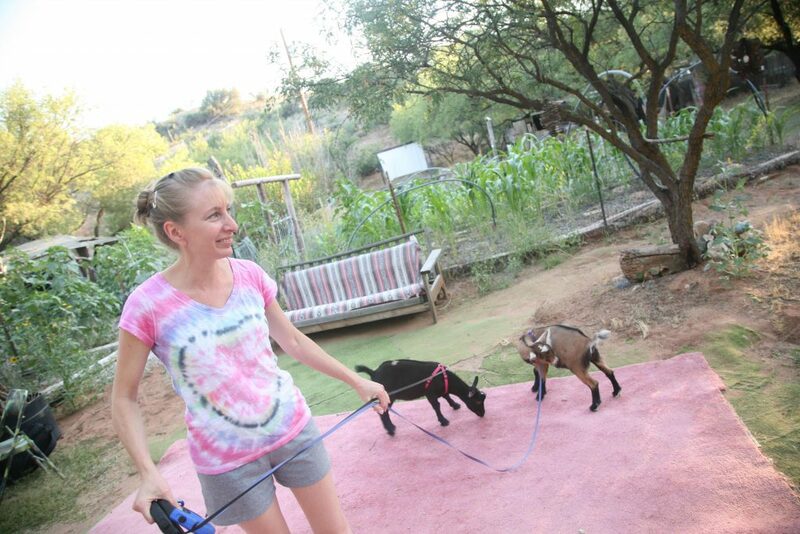 With its faded astro-turf pathways, donated by a Sedona tennis club, it’s like a surreal mixed-media miniature golf course. 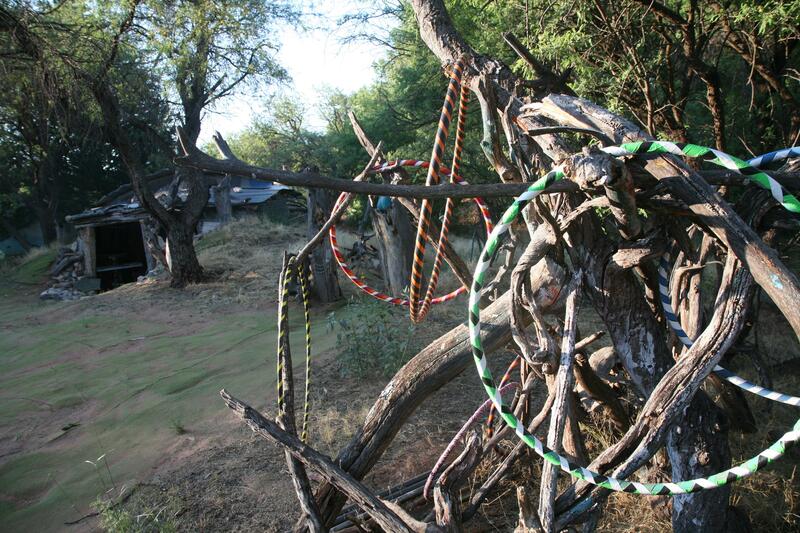 It’s an open-air museum of alternative possibilities. Eliphante is a dreamscape. It is also currently endangered: threatened by decay, crumbling infrastructure, and sitting on land at risk of being sold and leveled. 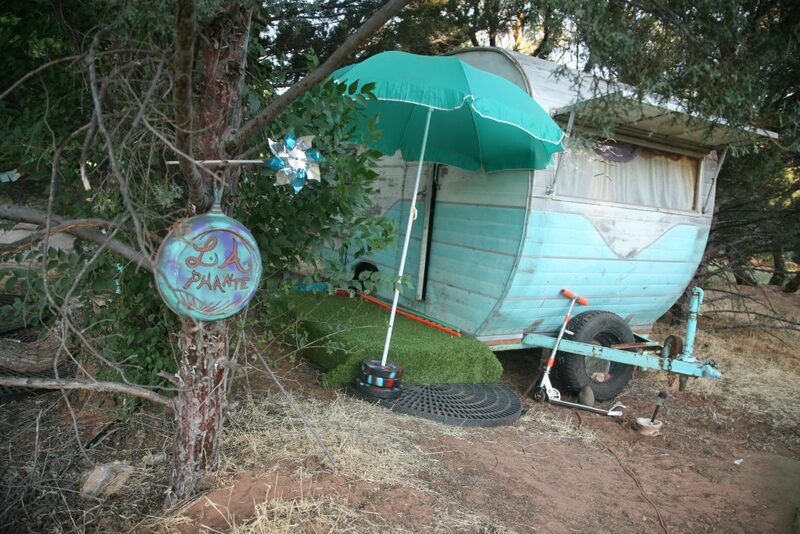 Traveling from Provinceton, Massachussetts in a 1960 Ford truck they called “Botchi”, Michael and Leda Kahn arrived in the Sedona area in 1977, artistic visionaries looking for a new way of life. It was not long before the Kahns connected with the Croziers, the landowners of the acreage that includes Eliphante’s parcel. The Croziers were also transplants from “back east”, and soon the Kahns were invited to become caretakers of the property. . The Croziers are benevolent landlords, generous and philosophical. A dynamic relationship was developed. In 1994, the Smithsonian American Art Museum catalogued Eliphante into its “SOS-Save Our Sculpture” public awareness project, a growing list of U.S. public sculptural art to be documented, and conserved. In 2008 Michael Kahn succumbed to Pick’s Disease, a form of Alzheimer’s. In his final years he lost the ability to communicate verbally, but this did not stop him from continuing his creative flourishes and projects at Eliphante. 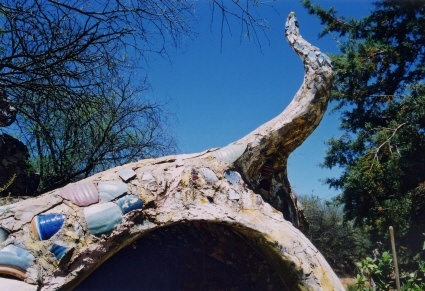 After his death, Leda moved away, to Santa Fe, New Mexico. Ms. Laurel grew up to lead a creative life unfettered by convention, yet full of travels, adventures, artistic pursuits, family, and continuing education. Fast forward to 1998. 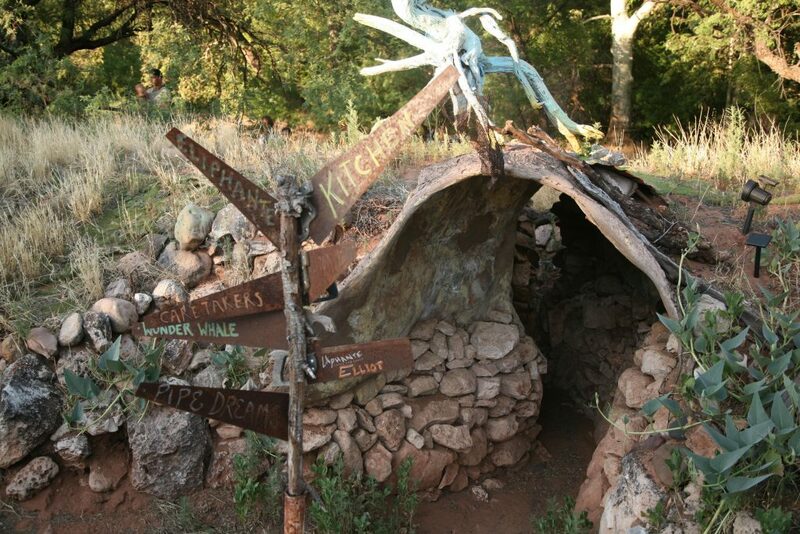 Ms. Laurel’s sister, Laurie, searched for their old camping grounds during a road trip through Arizona. 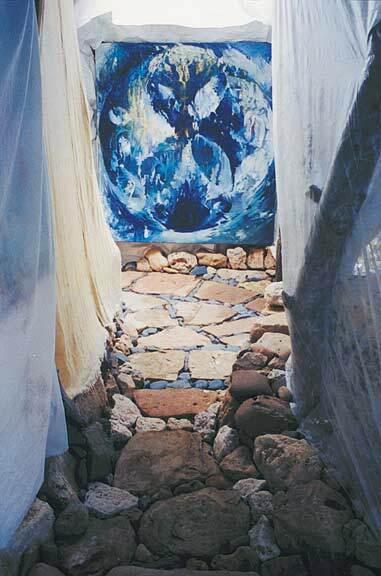 “When she went on to meet our old friend who owned that land and had given Mike free reign to build according to his artistic spirit, he told her that Michael Kahn was the one who came along to take our Dad’s place as a spiritual friend across the years. 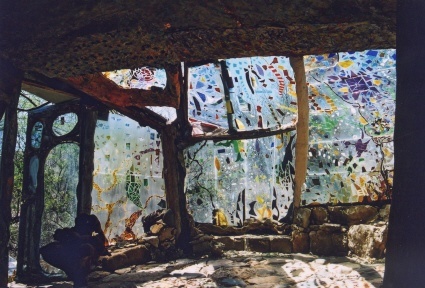 And the relationship had been mutually beneficial, the one providing a piece of land and the other a spiritual artistic vision and creative drive which together resulted in Eliphante, a magical inspiration to most who are lucky enough to visit it. Caretakers Ryan Matson and Tracy Schinagel arrived from Portland in 2009, and have called Eliphante home since August, 2010, along with their clever and handsome dancing goat, Midas, who nibbles away at weeds and provides manure for gardening. Matson and Schinagel are energetic and artistic; a good blend for Eliphante. In addition to raising the estimated funds for purchasing the property, the director and caretakers are also actively involved in much of the politics and paperwork necessary to preserve Eliphante for the future. The organization estimates they need to raise $75,000 -$100,000 to buy the land where Eliphante sits. Mr. Matson adds that further plans include establishing public access rights, so that they may have commercial activity to generate funds to preserve and restore the land and buildings. Smaller buildings are being patched against rodents and poor weather conditions. Solar showers, composting toilet system, and greywater gardens are also on the agenda. The roof at the Eliphante building is in dire need of repair. There are many ways you can become involved in the preservation of Eliphante. They have a weekly Sunday evening potluck, and work party sessions each Tuesday and Sunday, where volunteers can help create, build, restore, and repair. Online: Eliphante.org. Also be sure to like and follow “Eliphante Village” on Facebook. Other: Donating special knowledge or skills is also greatly needed and appreciated. In particular: non-profit legal advice, film-making for publicity and fund-raising, grant-writing, and special construction skills such as rock-work, roof-work, reinforcing of highly unusual post and beam connections, electrical engineering and plumbing work. Eliphante Ltd. is also seeking volunteers to organize and staff fund-raising events in January, February, and March 2011. “Eliphante is unique in all the world, born from the pure creative well at the core of the human spirit, unhampered by regulations from without. As a result, it speaks to that place of creative power in each of us, and most people respond with both awe and excitement about the possibilities of really living by one’s inner striving for beauty, really making it manifest, in all aspects of one’s life,” shared Alna Laurel. 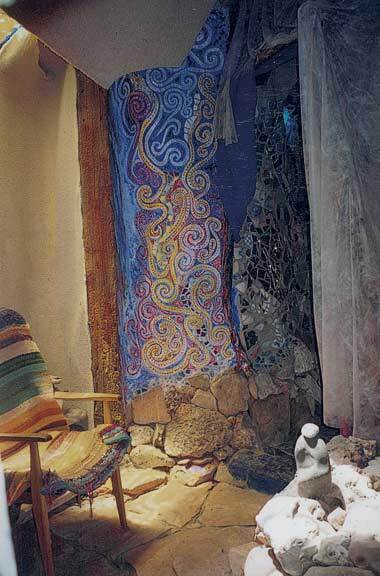 “Eliphante remains a place where one can go to feel re-inspired and have their sense of magical possibilities refreshed, and for this reason alone, it is worthy of preservation,” says Alna Laurel, “Add to that its potential as a venue for awakening people’s creative spirit and teaching how to let it blossom, and it becomes an urgent need in the present state of chaos and banality much of our society is experiencing. Where the human spirit feels acknowledged and empowered, there hope and renewal are born and sustained. 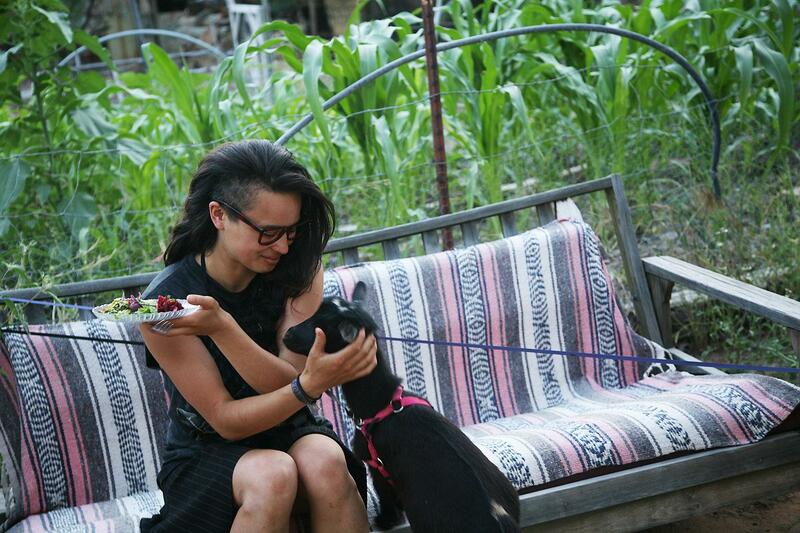 Story and Photos by Ellen Jo Roberts, who thinks Eliphante is the bee’s knees. They lived in their “Winter Palace” for the next five years while they built the main building that would be Eliphante, and the surrounding buildings, one of which would be called Hippodome, named this because it looks like a hippopotamus rising out of a body of water. 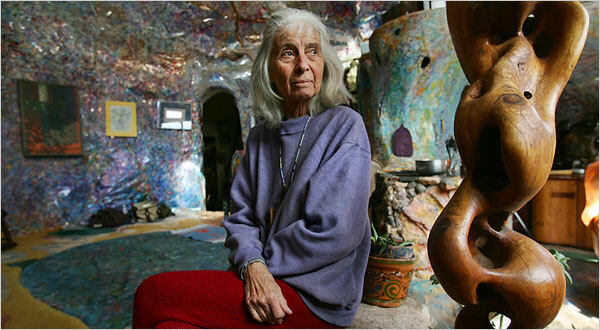 Livant lives in the Hippodome now – Kahn died a few years ago from a form of dementia. The Hippodome has a phone and running water and electricity, but no bathroom. Livant showers in a shower house that is solar-powered (and is pretty much just a hose in a shack), and if she needs to use the restroom she does it in the outhouse, or sometimes right out in the open. The property is fairly secluded, and is only accessible across a stream. Sometimes the stream is low enough that a car can just drive across it. Other times, you have to take a canoe. Their story is one of magic and tragedy – romance and heartbreak. Livant was a suburban mother of two, married to a psychologist. She dabbled in painting and drawing, but lived her suburban life and volunteered in the community. When her kids were a little older (one in college, the other in high school), Livant and her husband went on vacation to Cape Cod. That’s where Livant’s whole life turned upside down. Michael Kahn was a painter, ten years younger than Livant, and she fell for him immediately. She left her husband and her kids, and moved in with Kahn, taking housecleaning jobs to support them. All he ever wanted to do was paint. 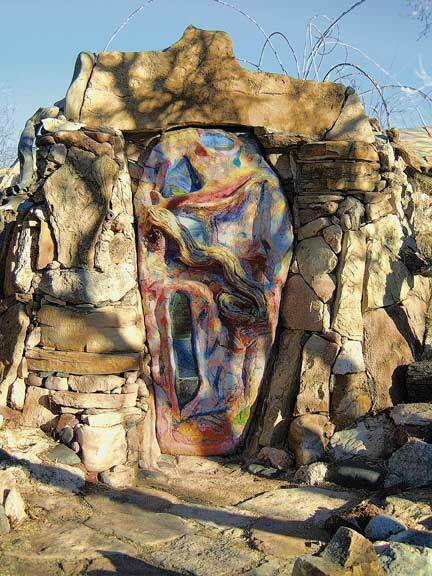 When they moved to Arizona they built and when he wasn’t building he was painting. Livant blossomed as an artist, and learned to weave as well as developed her painting skills. They were happy together. The house that was born of their union is part madness, part magic. 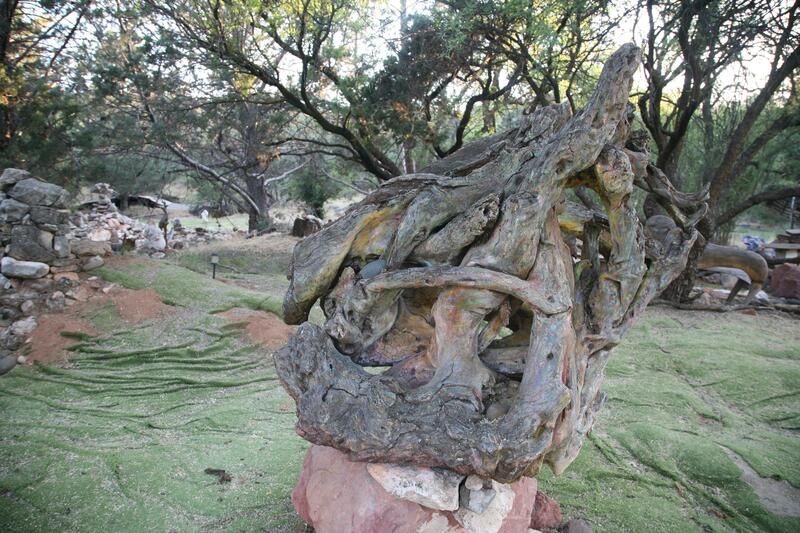 It is made of found objects and driftwood and any other thing they could find to build it. 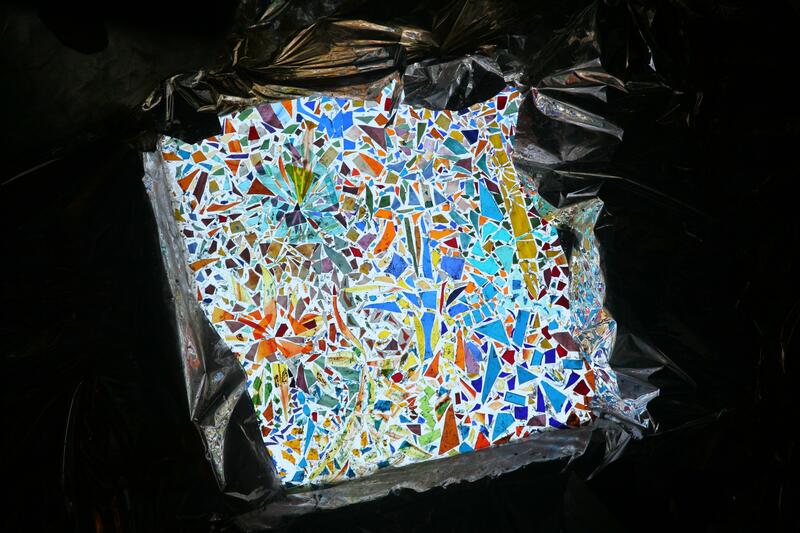 They have mosaic tile work that used salvaged tiles from someone’s kitchen remodel. They’ve made interesting use of AstroTurf. Though they started building in 1979, Eliphante & Hippodome and everything around them was consistently a work-in-progress. 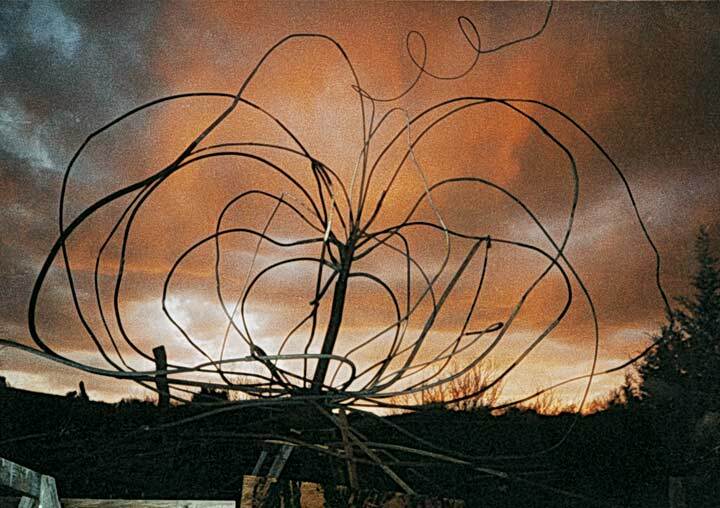 In 1987 Eliphante LTD was formed – a non-profit art company – and in 1994 the Smithsonian listed it with their Save Outdoor Sculpture movement. The property is in a state of disarray – in need of about $30000 worth or repairs. 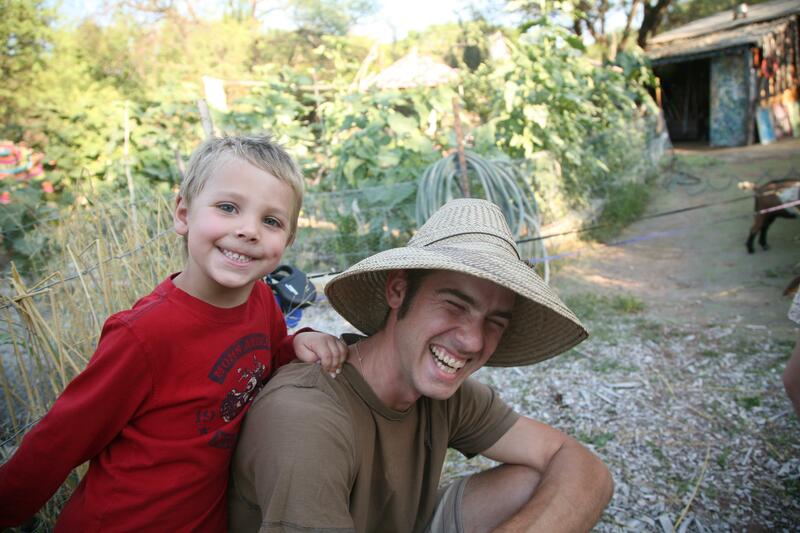 Livant doesn’t have the money, and Kahn wasn’t able to secure a grant before he died. 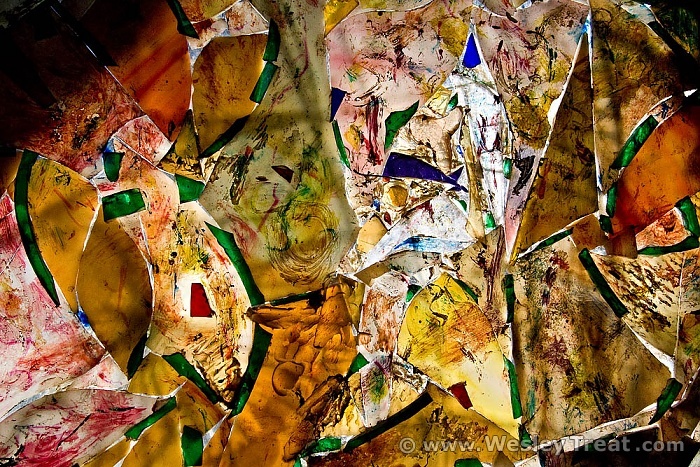 Let’s hope that someone comes in to do what needs to be done to preserve this artistic treasure. 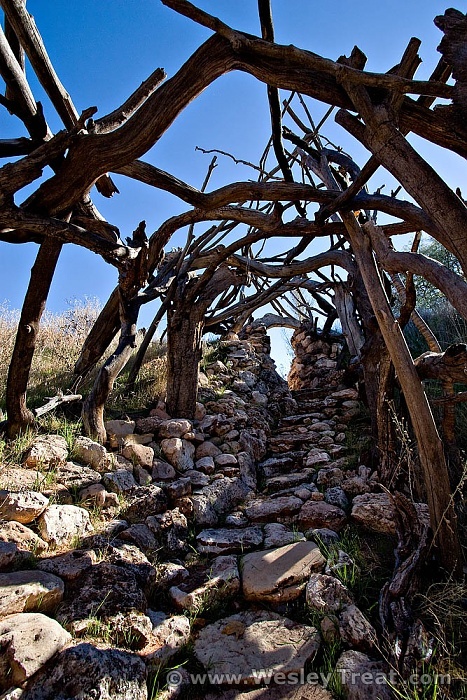 Your initiation into this alternate world begins with a tunnel of driftwood arches, a delicate and twisted passage that guides you upward onto a meadow. 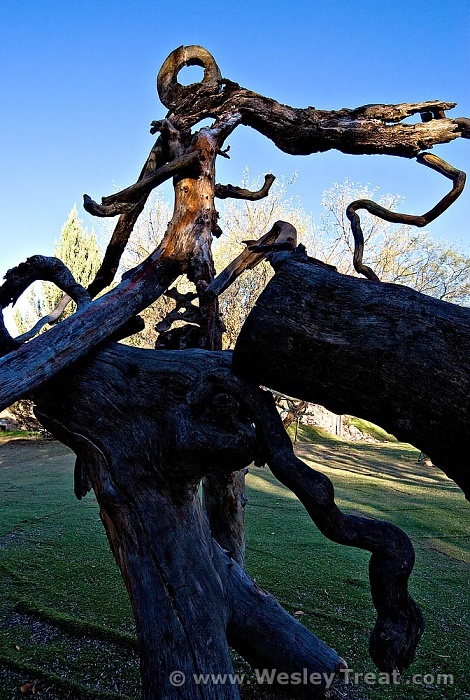 Sculptures of flotsam, of tree limbs and discarded metal, line your path. 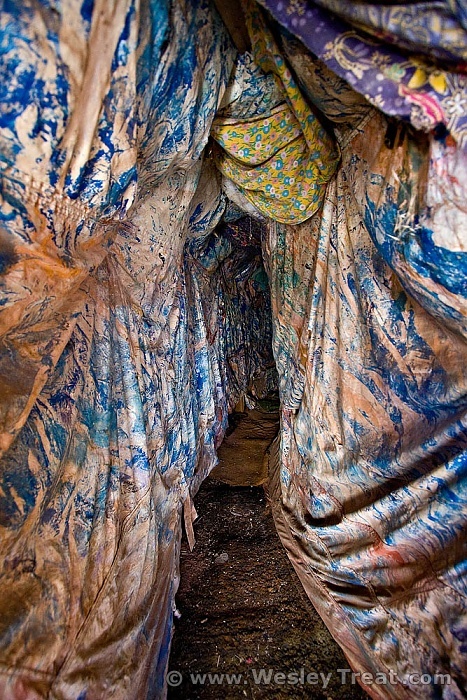 You step inside a cave-like entryway made of stucco and chicken wire and are funneled into a man-sized duct formed by what appear to be stiffened bed sheets, a comforting, yet motionless drapery that feels like it’s trying to anesthetize your brain as it crushes your body. Before you know it, you’re crawling on your belly through near darkness, with only a small, cherry-colored window to guide you. At the other end, you emerge into an isolation chamber, a very sparse and very calming room that offers only one way out: a squeeze-through doorway atop a 5-foot ladder. Back in the sunlight, you suddenly recall what birth was like. Welcome to Eliphante. And that’s only the beginning to this three-and-a-half-acre, abstract universe. 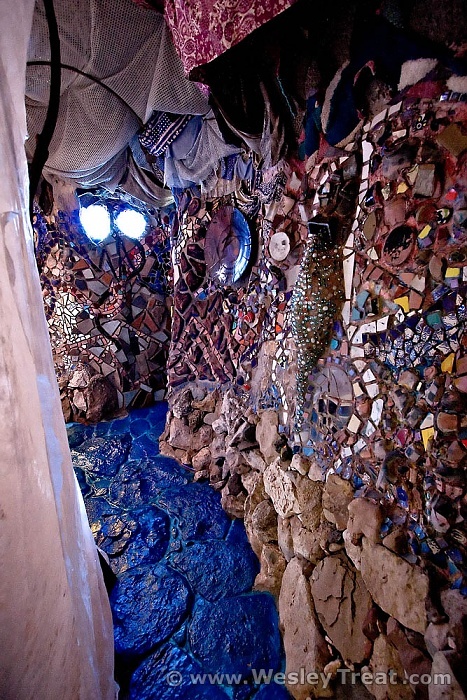 Yet to be seen are Pipedreams, the Hippadome, Birdland and the myriad mixed-media sculptures that connect them all. A visit here is like being in a collaborative reality conceived by Lewis Carroll, Andy Goldsworthy and Tim Burton after sharing a bottle of absinthe. It’s a world that has to be experienced more than seen. 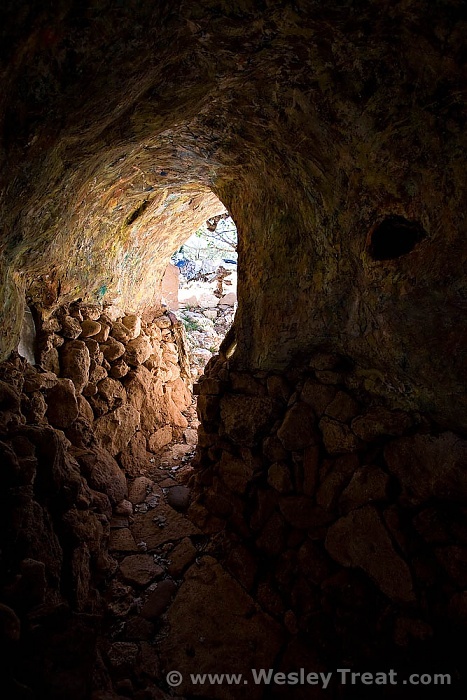 In point of fact, interaction is a requirement, as demonstrated by the initial subterranean journey that practically forces you to become part of the composition. The artwork here surrounds you. 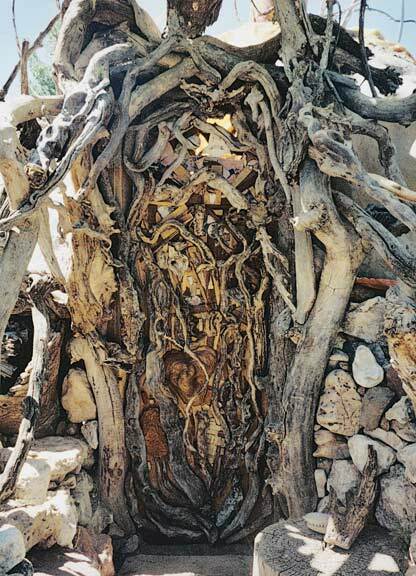 It’s as if all the pieces in a gallery had fused with the walls, were devoured by the earth and the trees, and continued to grow as one, heteromorphic organism. 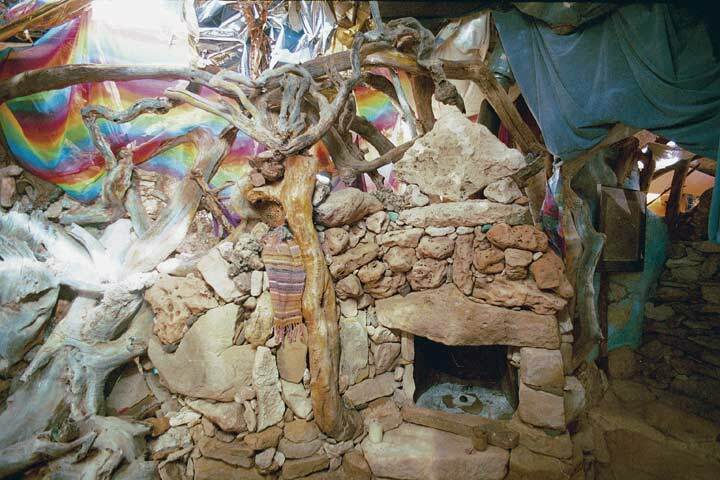 The collective title for this world comes from the first structure to be built here when Leda Livant and Michael Kahn moved to Cornville and began building their home in 1979. The building, which acquired an unintentionally elephantine appearance as they improvised its construction, developed a long, igloo-like entryway that resembled a trunk. When the artists’ landlord noticed the similarity, he jokingly hailed, “Eliphante!” and the name stuck. Though Michael and Leda have chosen this grove of surrealism as their home, they’re surprisingly down-to-earth people. Upon casual observation, the average suburbanite might throw around the word “hippie,” but the term doesn’t stick. 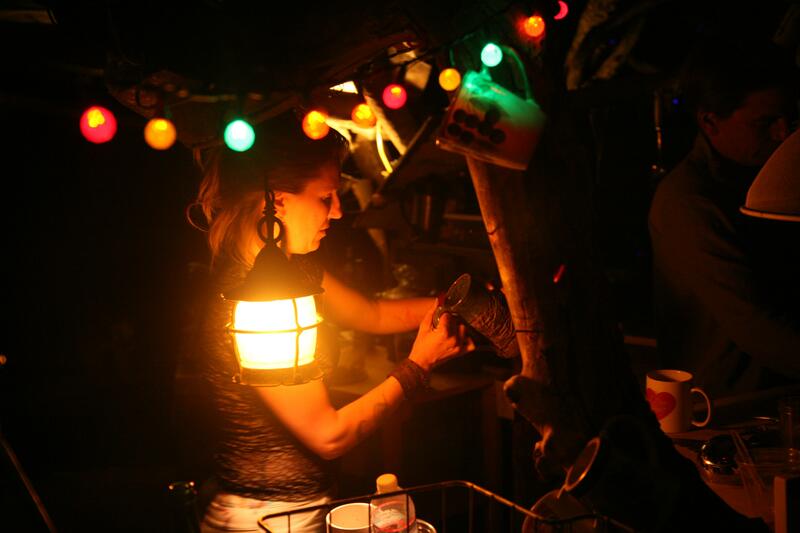 True, not a corner of their environment escapes some kind of artistic alteration and they do live outdoors most of the year, but they are on the grid and they do run a business. 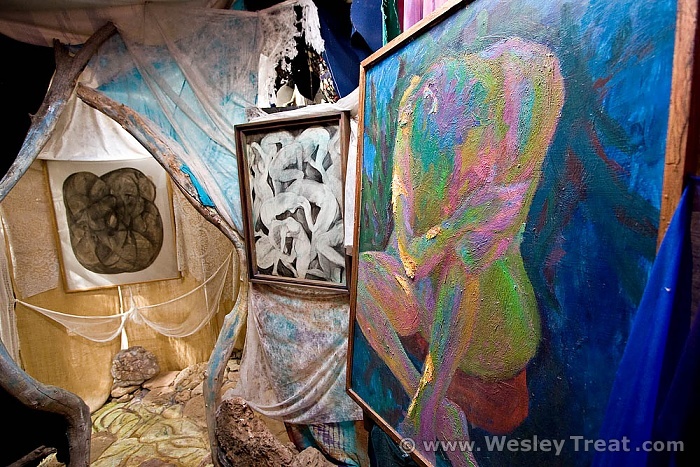 They love to talk about their art and their visions, but not in a really esoteric and pretentious kind of way. Some of what they do may seem unconventional — like the fact they’ve covered the entire ground outside with artificial turf — but such unconventionality usually has a sound motive — the plastic grass cuts down on mud and snakes, that’s all. In short, they’re practical people, just a little more lenient on where they draw the line at eccentricity. Is Eliphante a sculpture park? A playground? A museum al fresco? You’ll have to figure that out for yourself. 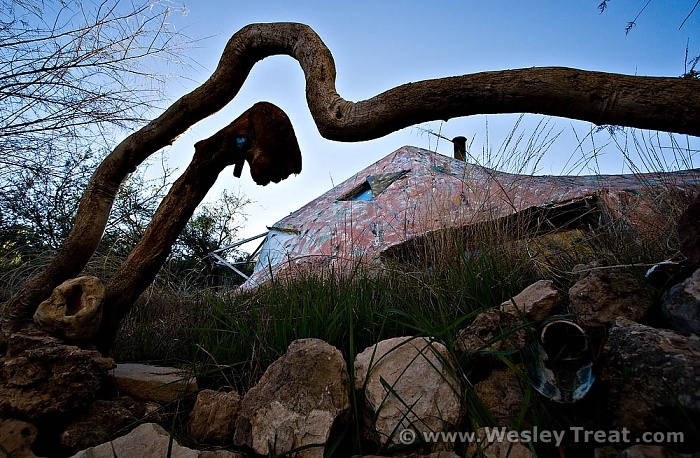 Article and photos courtesy Wesley Treat’s Roadside Resort. 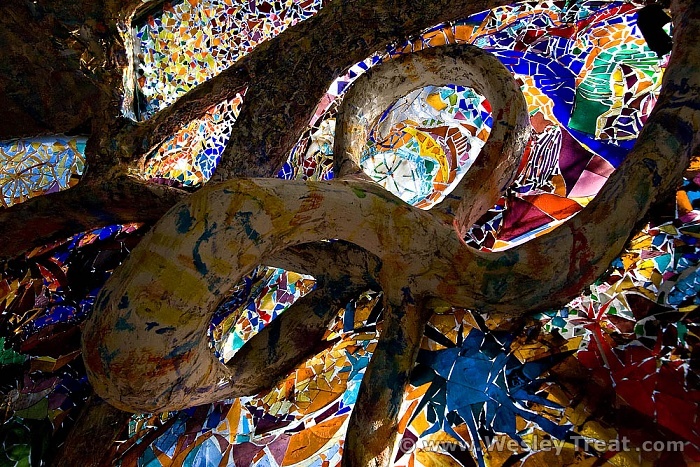 Located south of Sedona, near the town of Cornville, Arizona, Eliphante is a mesmerizing sculptural and architectural environment created over the past 20 years by artists Mike Kahn and Leda Livant. 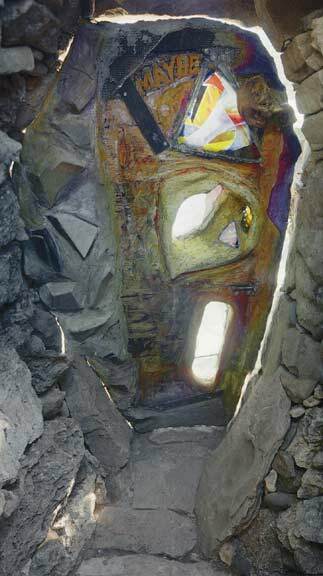 · Eliphante, the original construction, with a cave-like entrance tunnel that leads to a magnificent vaulted room complete with a built-in piano and walls of driftwood mosaics and colored glass. 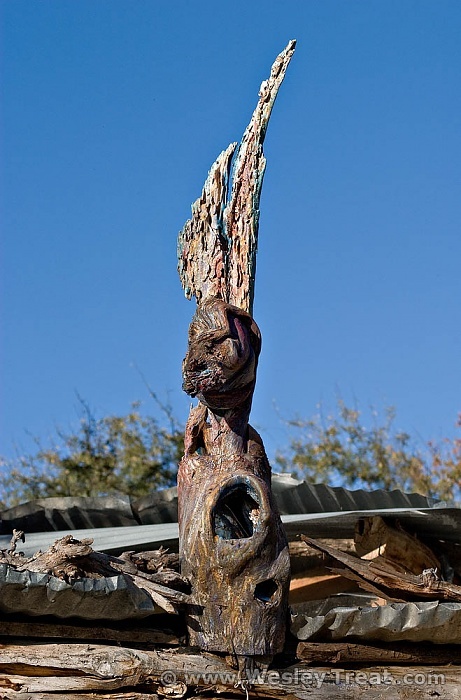 · Pipe Dreams, where Mike & Leda display their paintings and sculpture. 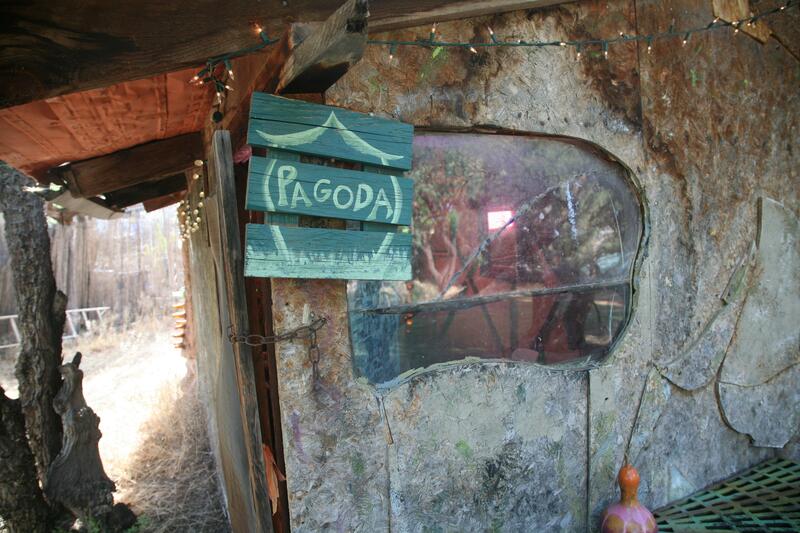 · The Hippodome, Mike & Leda’s living quarters, furnished with beautiful free-form wood furniture. 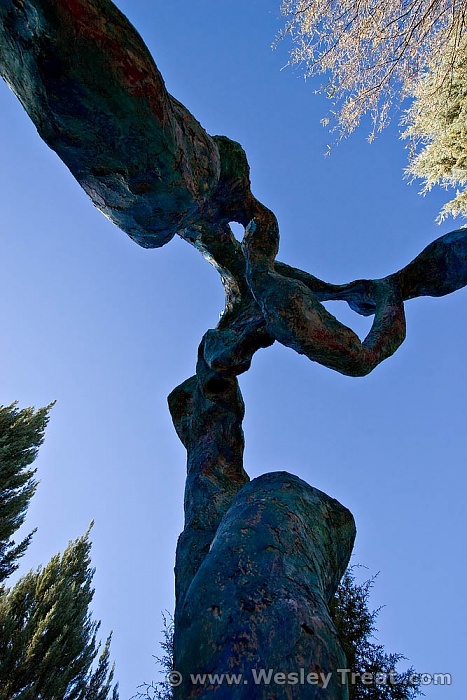 In addition, the grounds are accented with arbors, gardens, a pool, and sculptures. The only thing Eliphante does not have is extra film / memory card for your camera. You will need it. Upon arrival, I found the creek still flowing. I didn’t realize there were rocks arranged above the level of the water on which I could have walked across, so I just lifted my skirt and waded through. (I was glad I was wearing my sturdy, all-terrain Keen sandals). I can’t imagine anyone stumbling upon Eliphante, so the clever sign in this photo I took must be a reminder to members. As soon as I walked up to the outdoor kitchen, a little kid (probably about four years old) introduced himself and his brother. Then I saw one of the fellows I’d met at NeoTribal. We were happy to see each other, and he took me to sign the disclaimer that said I wouldn’t hold Eliphante liable if I got hurt or died while I was there. I like the way they got it right out there that anything could happen, and I was responsible for my own damn self. After I signed the liability waiver, I was on my own to walk around and look around and poke around. I put my camera in my pocket and went exploring. 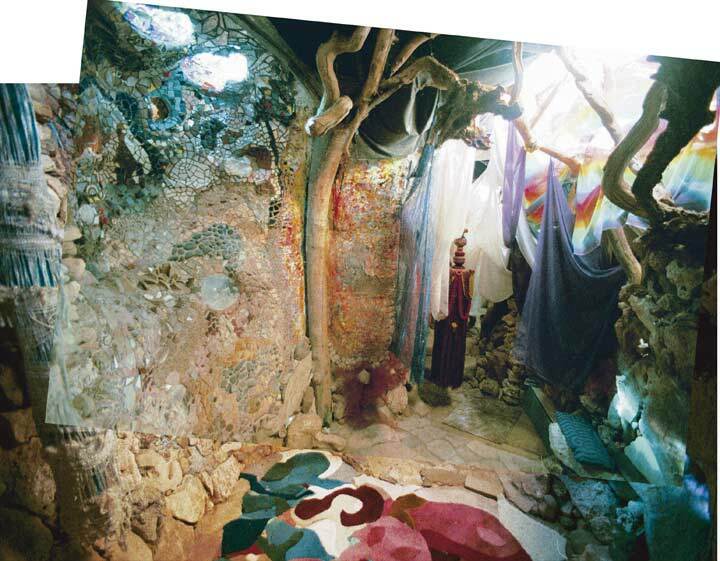 The Winter Palace, the first home of Michael Kahn, and his wife Leda Livant Kahn [was] built when they first moved to the Cornville area….The space is a gallery of sorts, as it houses items for sale made by artists associated with Eliphante. 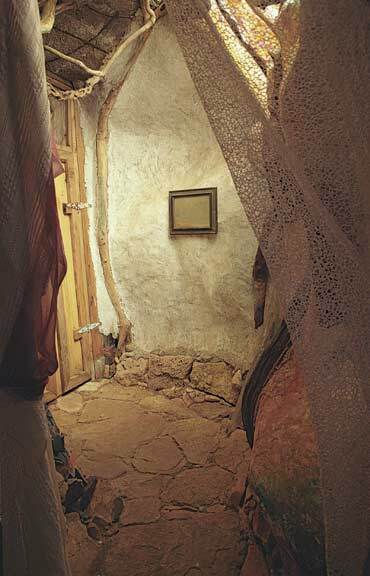 The one-room building is very tiny, and I told my guide that I can imagine living in such a small space alone, but not with another person, even another person I loved very much. 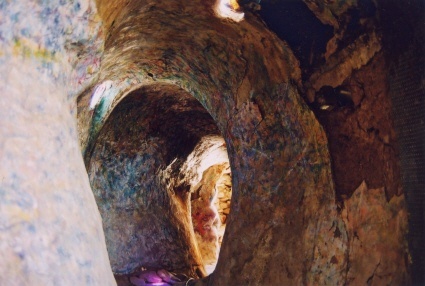 Eliphante, the original construction, with a cave-like entrance tunnel that leads to a magnificent vaulted room complete with a built-in piano and walls of driftwood mosaics and colored glass. 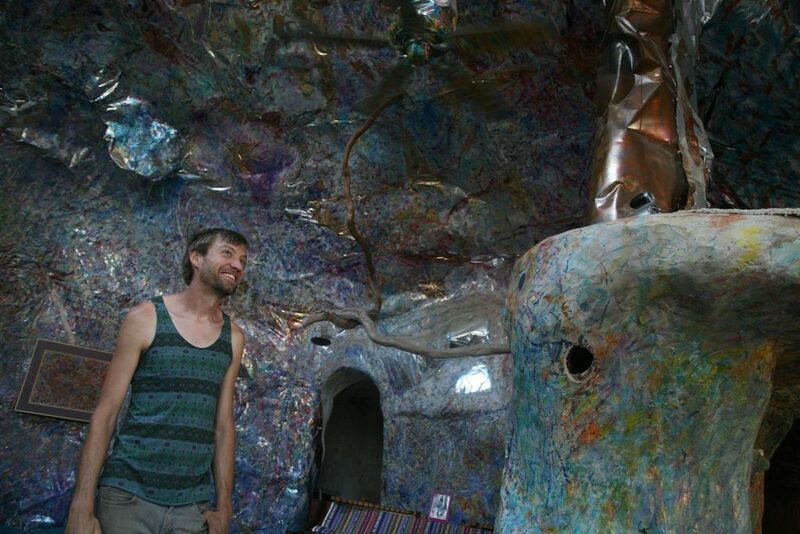 Pipe Dreams, where Mike & Leda display their paintings and sculpture. 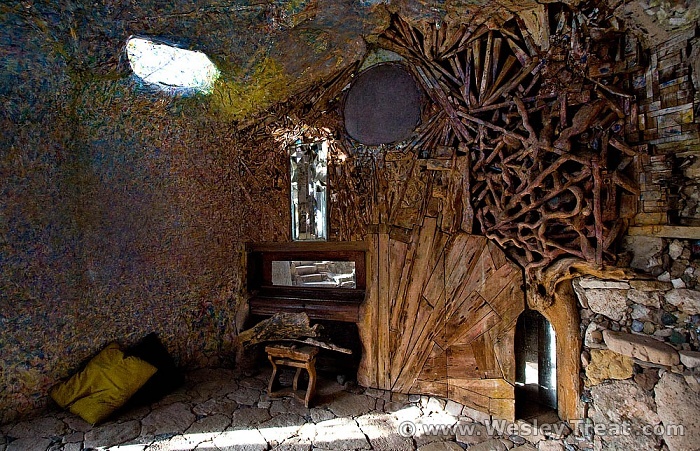 The Hippadome, Mike & Leda’s living quarters, furnished with beautiful free-form wood furniture. 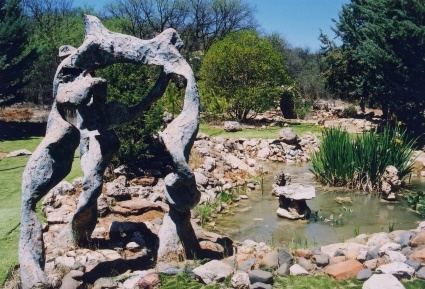 In addition, the grounds are accented with arbors, gardens, a pool, and sculptures. 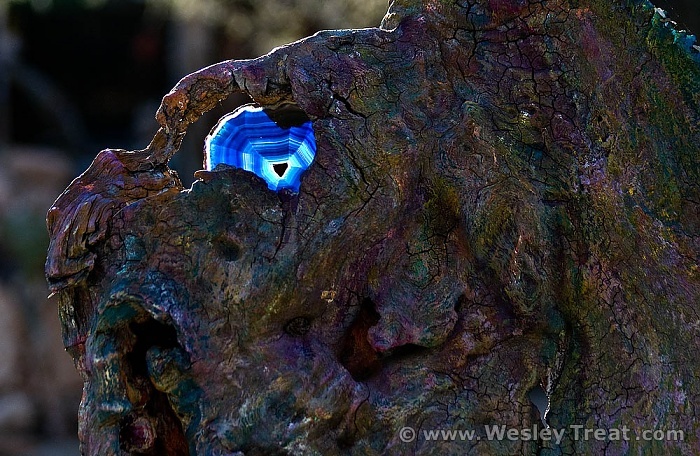 Check out the article and photo gallery of “The Amazing Eliphante” via Detour Art. Eliphante. Melodic to say — and hard to explain. 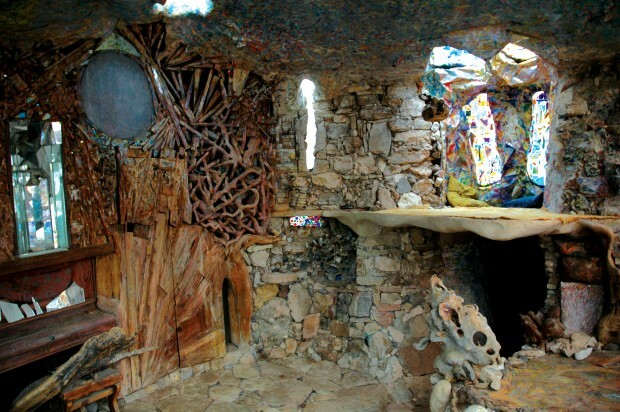 The hand-built collection of buildings and sculptures began more than 30 years ago as a painter’s vision, tucked away off a residential street in the tiny town of Cornville. People say you can’t put it into words. You just have to be there. So there I was, heading down an overgrown, winding path on the four-acre plot. I was padding over fake grass, beaten down by decades of sun and feet. “Yeah, this place does look like a mini golf course of sorts, except for — more strange,” said Cole Lahti, the unofficial Eliphante ambassador. She took me past amorphous sculptures and little shacks drenched in color. We finally found Ryan Matson, Eliphante’s executive director for nearly six years. He’s one of a half dozen caretakers in their 20s and 30s who live onsite in a small village of vintage trailers. “We bring a little bit of youth culture to Eliphante,” he said. They’re continuing what painter Michael Kahn and his wife, Leda Livant Kahn, started here on the lush banks of Oak Creek more than three decades ago. 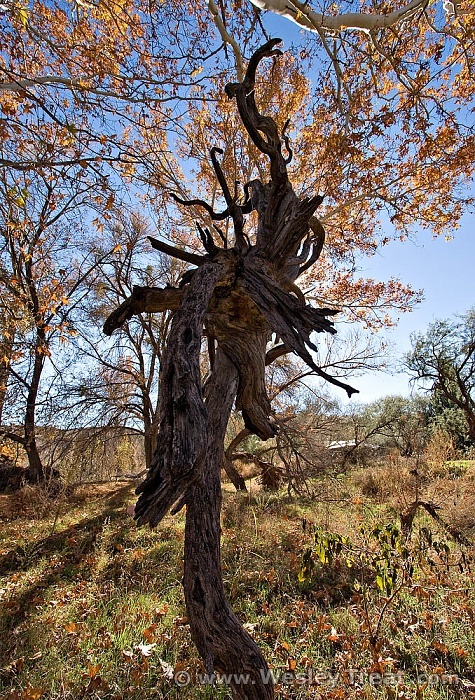 It’s beautiful and shaded and used to be mistaken as public land, before its owners asked the couple to be caretakers. “It was just a handshake,” Matson said, which grew into a tangle of structures made by two people with no architectural experience — or plans. Just spontaneous creativity. 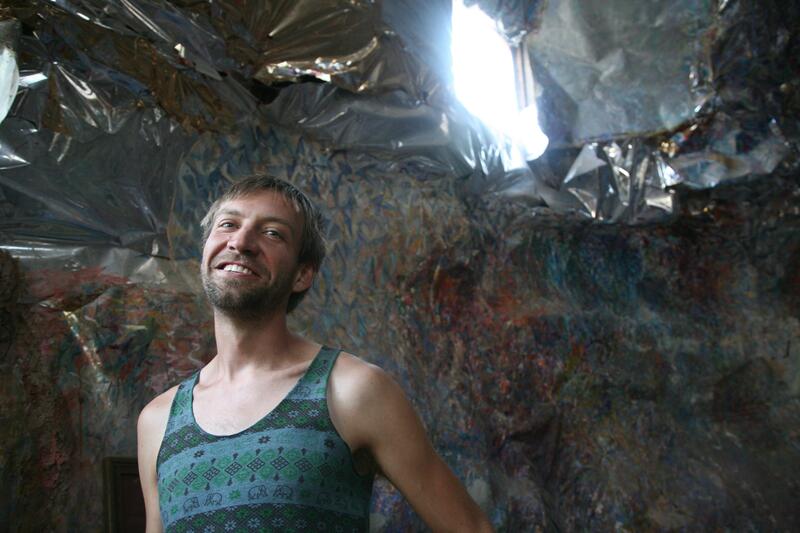 “It sort of unfolded from their minds or extended off of their canvas,” Matson said as we headed into a building he calls the “heart” of Eliphante. We walked under a giant, vaulted ceiling. I want to say it looks like something. 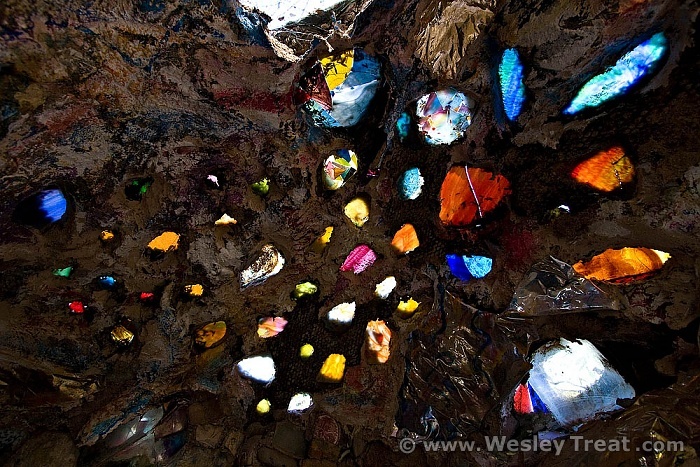 A colorful ear canal, maybe? 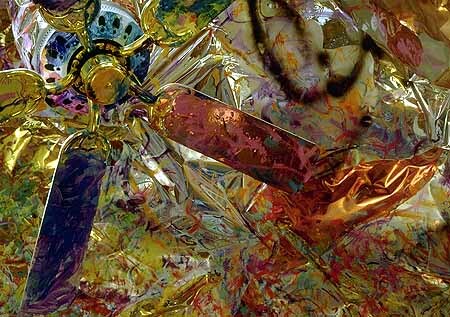 But the domed cathedral-like structure is a hodgepodge of so many things: stacked rocks on the wall, a carpet mosaic on the floor, shiny Mylar on the ceiling. It’s the kind of building you couldn’t “get away” with making these days, Matson told me. That’s a tradition Matson and a core group of Eliphante believers want to continue. They’ve spent the past few years raising awareness and money. Enough to purchase the land outright. Their mission? Explaining to the public why this place matters. She’s nearly 90 years old and now lives in an apartment in nearby Cottonwood. But she’s still involved in the place and happy to see it on people’s radars one more. She said she and her late husband probably had thousands of visitors over the years. “Everybody felt they had been given a gift by visiting Eliphante,” she said. Some people would tell her the place inspired them to change the colors in their own home, or throw out their furniture and build new pieces themselves. “But, I mean, everyone was so excited,” she said. And that excitement can still be felt. Back at Eliphante, darkness had fallen over a monthly celebration of Eliphante lovers. A vegetarian potluck was filling the outdoor kitchen and an impromptu band had struck up a song (musical experience not required). 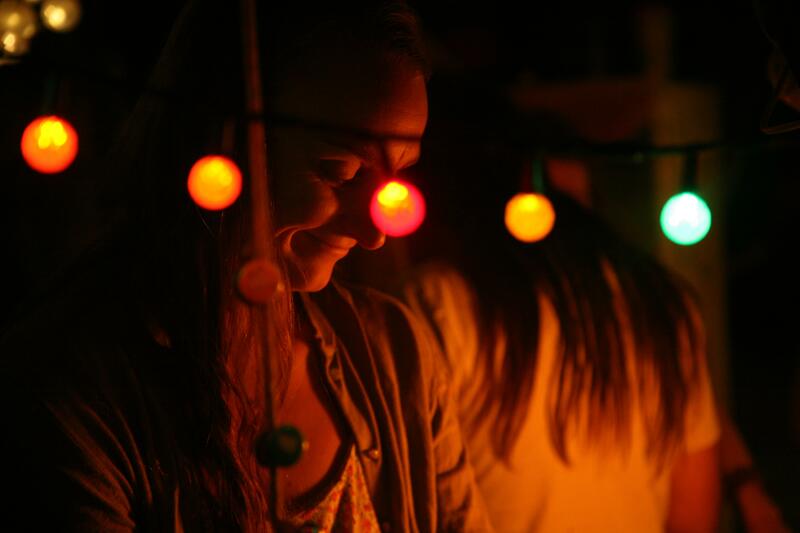 Jerome resident Jessica Laurel Reese was sitting underneath a wonderland of trees sparkling with tiny, projected lights. And maybe it nudges you to create something beautiful and strange and free of rules in your own life. Check out the article and photo gallery “Exploring Eliphante, A Hidden Arizona Art Haven” via KJZZ. Eliphante, Mike’s first major building, was constructed in three years. 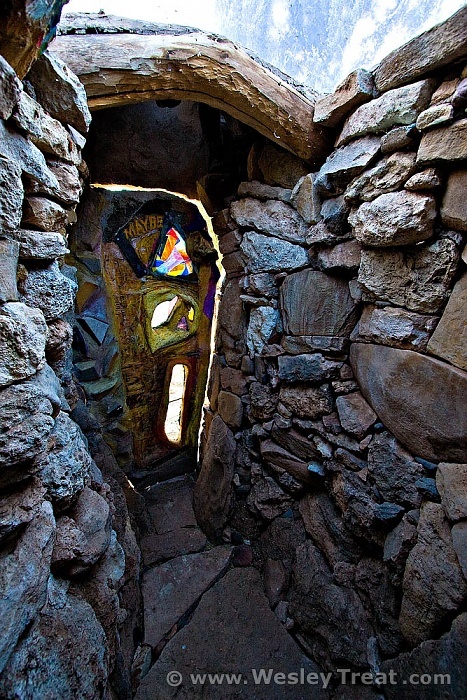 It was built out of “…adobe, wood, stone, ferro-cement and glass.” To enter, you wind through a sculptural painted tunnel into a room with stone floors, steps, terraces, and a multi-colored profusion of stained glass. The center of the large glass wall ended up looking (unintentionally) like an elephant. A friend came by one day, looked at it, and said “Eliphante,” and so the building was named. 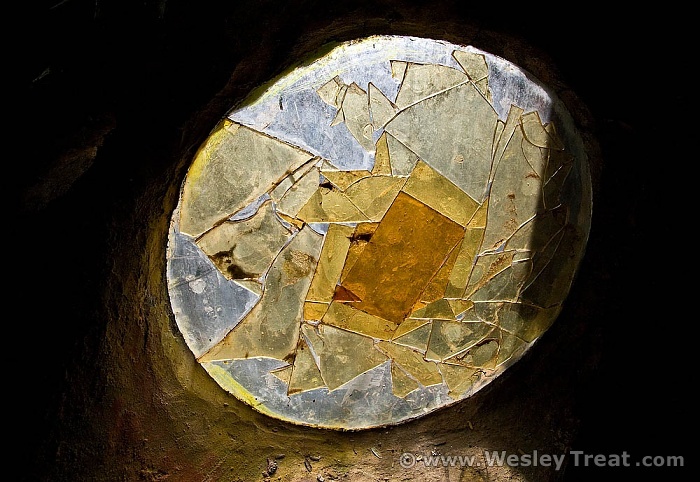 There is a large pond outside Eliphante, a solar-heated shower building, an underground kiva and sculptures of rock, mirrors, and found objects throughout the grounds. 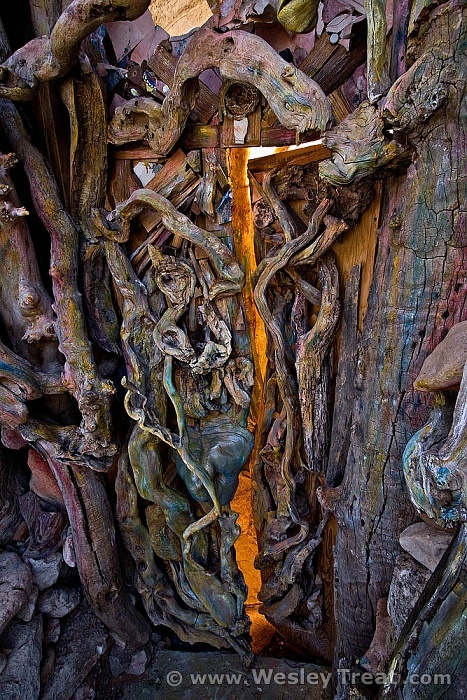 Read the entire “Eliphante: Michael Kahn’s Sculptural Village in the Arizona Desert” article via The Shelter Blog. 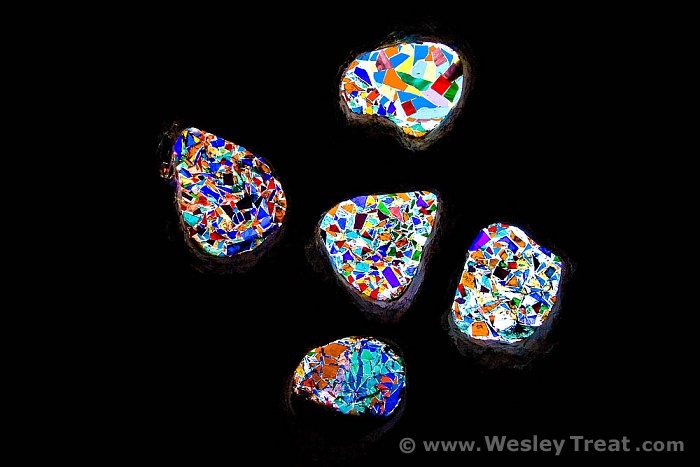 Soon, Michael began to build a home out of anything he could find — from rocks on the property to discarded construction supplies, unused Astroturf and broken glass. 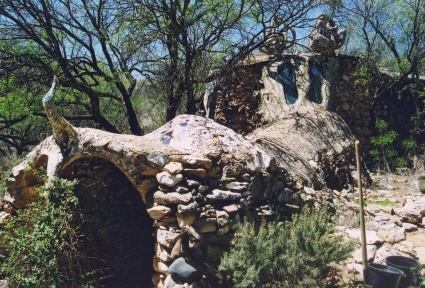 The home flourished into a work of functional art later christened “Eliphante,” the faux-French name invented by Crosier because the tunnel entrance looked like the trunk of an elephant. 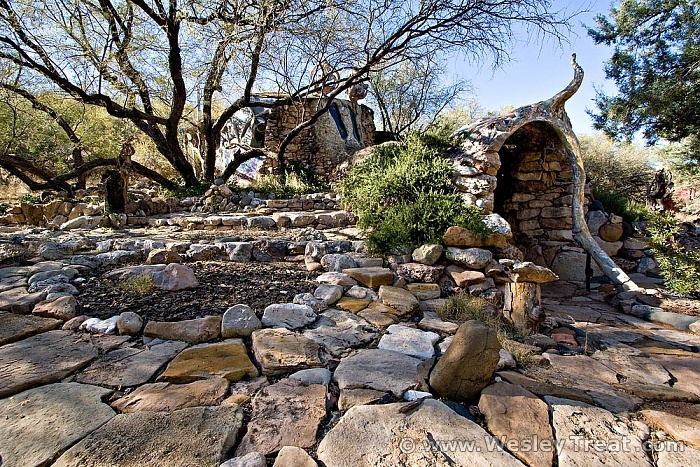 Kahn built other similar structures and artistic expressions on the property. This includes the Winter Palace, Pipedreams and Hipodome. The property evolved into one beautiful jumble of an outdoor art installation. Work might have continued, but Kahn passed away in late 2007 from a rare neurodegenerative illness known as Pick’s Disease. Any combination of those words could be used in describing Eliphante. It is a work that, with its creator’s death, has found a kind of completion. A few months after Kahn’s passing, the New York Times ran an article on it. 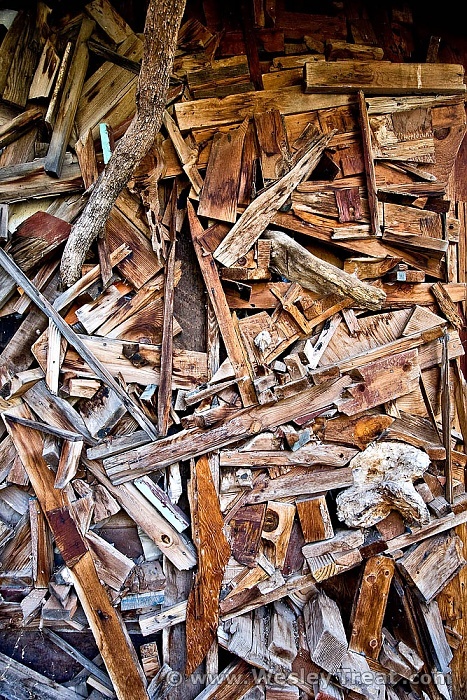 It drew interest both for its artistic expression and for the notes of sustainability that come from the creation of the buildings from recycled material. After several minutes, we arrived at the entrance of the building that started it all. Standing to one side of the entrance, the building does appear as a fanciful elephant. 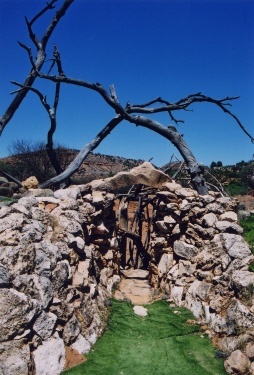 A tunnel forms the trunk, which leads to the main dome that was originally intended to be the Kahns’ home. “Shall we?” Allen said. She walked into the tunnel, but stopped to ring a bell that hung from a string near the entrance. “You have to ring the bell,” she noted. We moved back through the tunnel, made with slight bends to it so as not to fully reveal what was ahead. 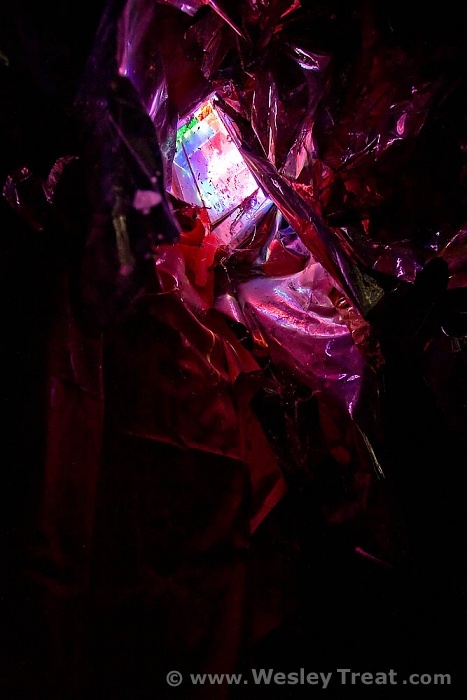 We emerged from the tunnel and stepped into the dome of the main room — its own kind of sensory experience. Kahn built Eliphante as a residence. A stove for heating and cooking and a small sink take up space at the center of the dome. 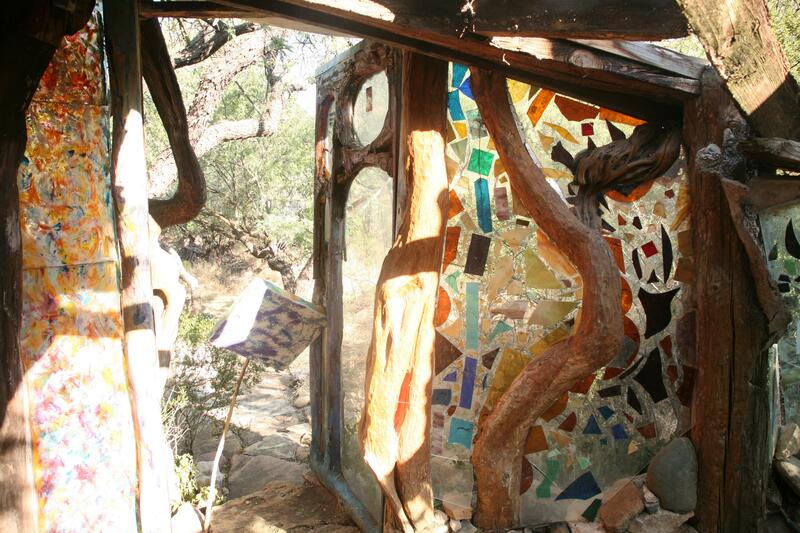 Everything around it is a swirl of stonework, woodwork and glasswork. “They never lived in Eliphante, but that was the intent,” Allen noted. 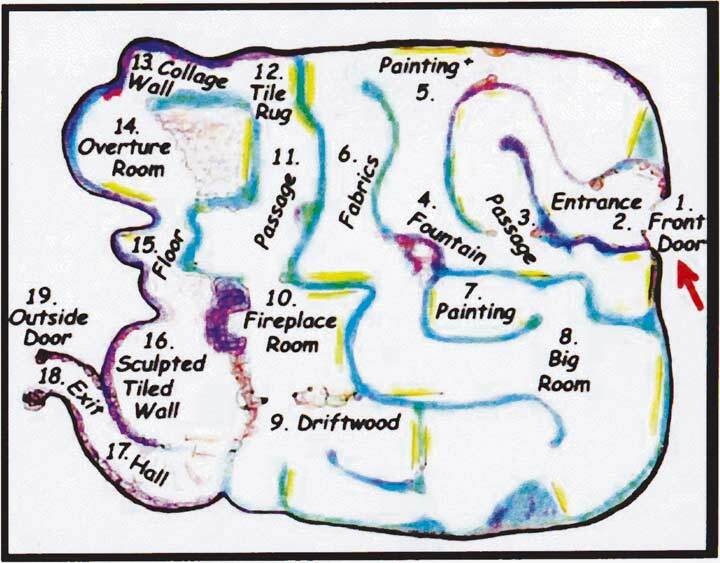 The labyrinth of a structure was created as a gallery. 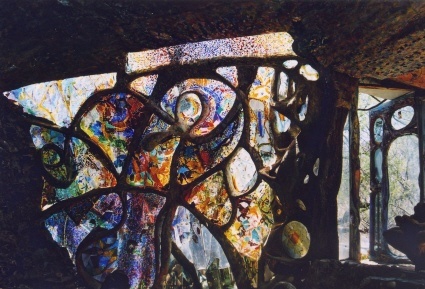 Kahn designed it in a way where the viewer comes in close contact with his abstract paintings — and so that no two paintings could be viewed at the same time. As an artist, Kahn put his passion for painting first. 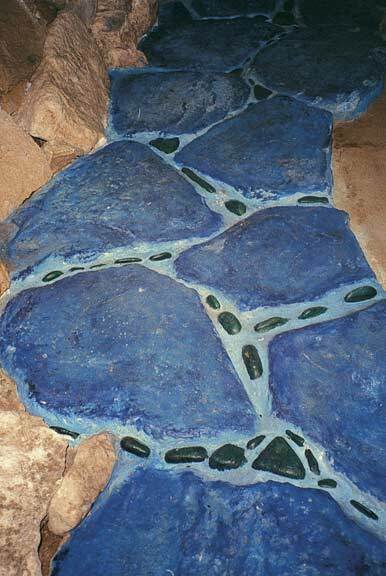 The work at Eliphante was a diverted path that he explored. After we left Pipedreams, Allen and I toured the place known as the “Winter Palace,” a one bedroom shelter Kahn built for himself and his wife. She asked that he build a place while they waited for him to finish Eliphante. We also checked out the outdoor kitchen, where Livant Kahn did most of the cooking; the gardens built in fiberglass boats to fend off the gophers; and a shelter that serves as an open-air gallery of sorts. From there, we walked to the third of the three significant structures. Known as the “Hipodome,” the construction and design is much like Eliphante. Livant Kahn greeted us at the door. Alna Laurel also joined us inside. Over green tea and danish during my visit, Livant Kahn talked about the spirit of Eliphante, in many ways a thriving testament to her husband’s life and a world of artistic homes that today would be considered sustainable — recycled and local materials, solar-heated water and designs that utilize the environment. But, Kahn did not do it to be trendy. 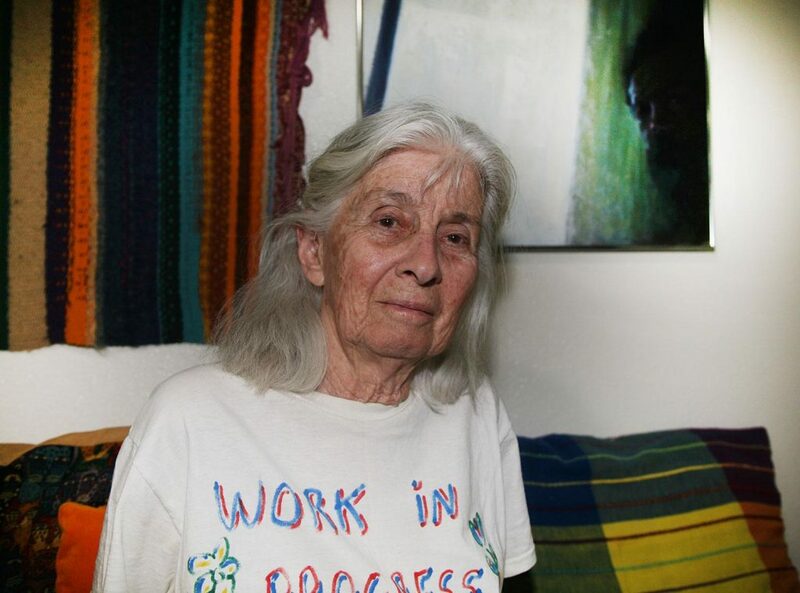 After nearly an hour talking at Livant Kahn’s table, she offered a final reflection on the place. 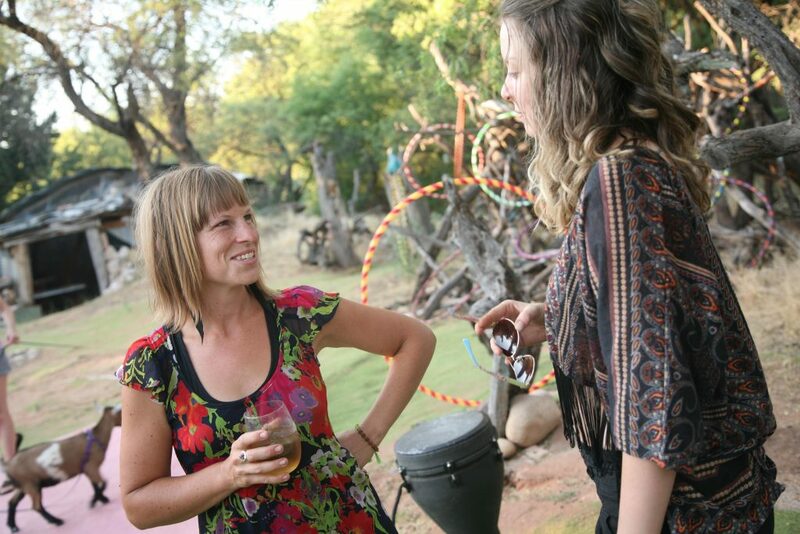 “Fragments and Dreams: The twisted journey to the heart of Verde Valley’s Eliphante” via The Arizona Daily Sun. 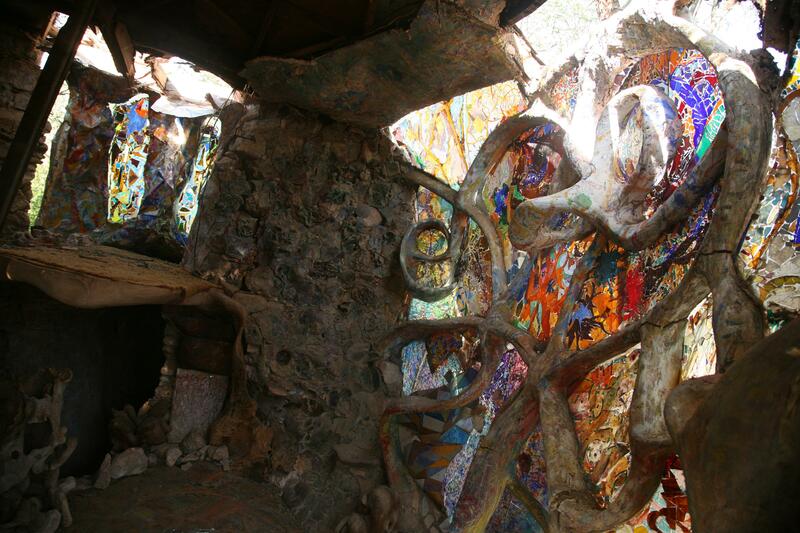 This is how it was with the little-known sculptural home that is Eliphante, three acres of fantastical domes, shacks and follies created over 28 years by Michael Kahn and his wife, Leda Livant. 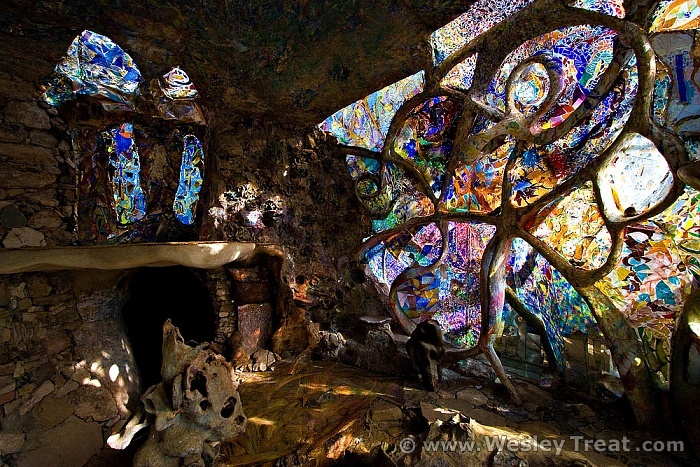 Here there is the residence, which has 25-foot ceilings and incorporates rocks and scraps from construction sites; there, a studio, one wall of which is the Ford pickup that brought the couple west; and a labyrinthine art gallery called Pipedreams, in which every painting has its own environment. The building that gave the compound its name has a long, trunklike entrance made of rock and an irregularly mounded roof. “Aaah, Ella-fahn-tay,” a friend joked soon after it was built, giving it a playful faux-French pronunciation. The couple began building when they first arrived here, although they did not own the property, and they continued to do so until the progressive brain disease, which killed Mr. Kahn this December at age 71, robbed him of the ability to speak. 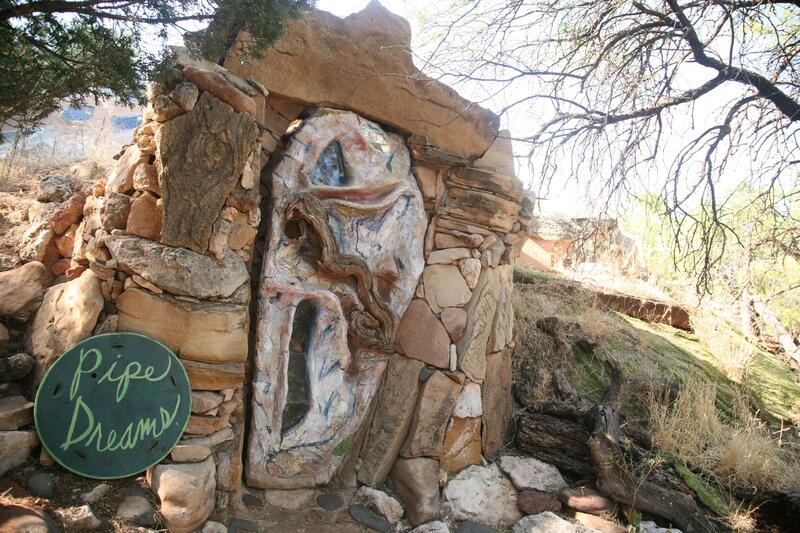 Eliphante is in red-rock country, near Sedona, and while Ms. Livant and Mr. Kahn turned it into a non-profit arts organization in the late 1980s and she still permits occasional tours to offset the costs, it remains hidden. (Information is at eliphante.org.) 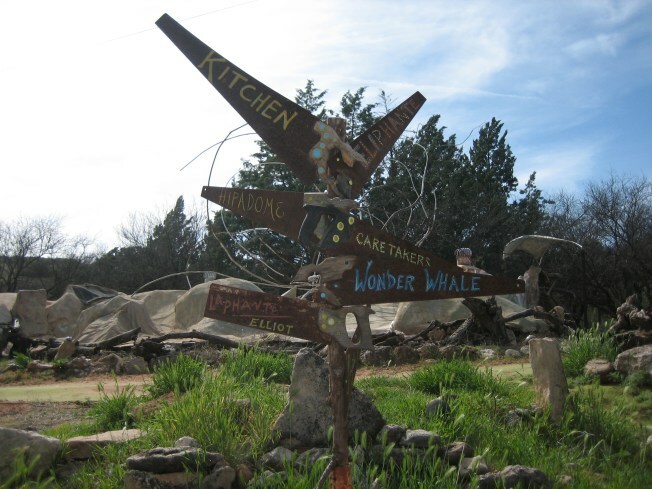 The sign, painted on a stump, is small, and the compound is bounded by a creek. If the waters are low and a vehicle is sturdy, a visitor can drive across; otherwise Lonnie Haight, a 46-year-old woodcarver and handyman who helps out at Eliphante, will get you in a canoe while Ms. Livant waits on the other side. This is where she was last week, a beautiful old hippie with lush white hair, a pink vest over a purple sweater and, around her neck, a leather pouch that does not contain, as one suspects, her husband’s ashes, but her hearing aid. 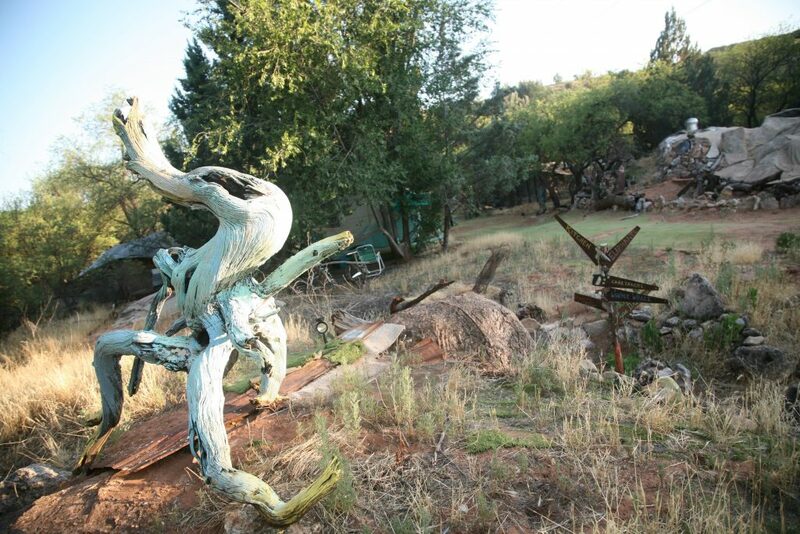 Everything is slightly off-kilter, and many structures and pieces of art have been damaged by the floodwaters of the creek, the climate and what Ms. Livant calls critters. In the mountains of Arizona, that means more than squirrels. “You know what that is?” Ms. Livant says, as she takes a visitor up the rocky hill leading to the compound. 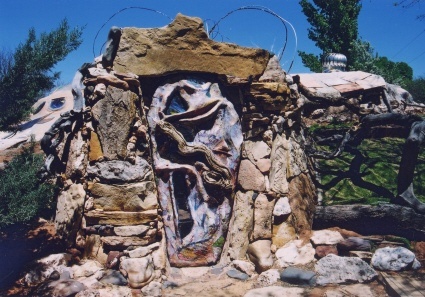 “Coyote poop.” A portal in a rock wall that once afforded a panoramic view of the property has been filled with dirt by a gopher. Mice nibble the ends of the canvases in the Pipedreams gallery. Last year, Ms. Livant’s dog was killed. Ms. Livant’s residence is called Hippodome. It rises gently out of the ground, looking somewhat like a hippo emerging from a lake. 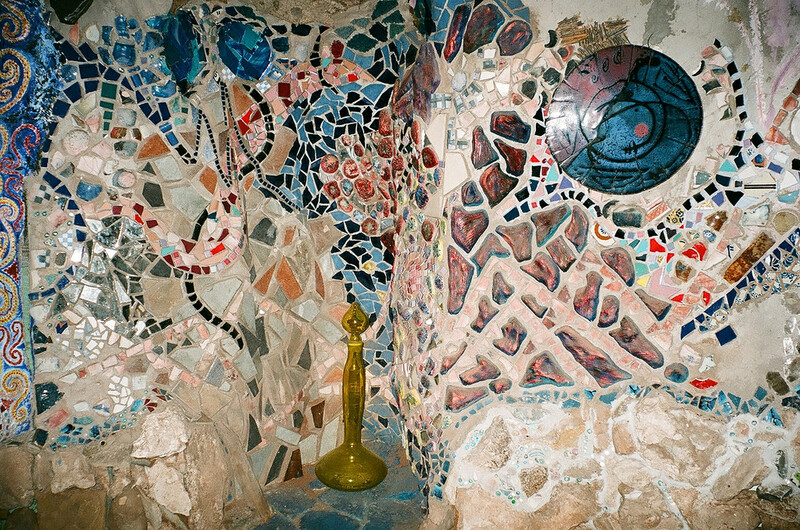 One exterior wall has a mosaic of yellow and blue ceramic tiles, left over from somebody’s expensive kitchen renovation. Ms. Livant’s daughter, Wendy Jones, who has come in from Halifax, Nova Scotia, for a visit and is a communications manager for the Canadian Broadcasting Corporation and a life coach, says she understands why it might make a visitor stop and stare. “Looks like something a Hobbit would live in, doesn’t it?” she asks. Hippodome has electricity, heat, a phone line and water, but no bathroom or toilet. 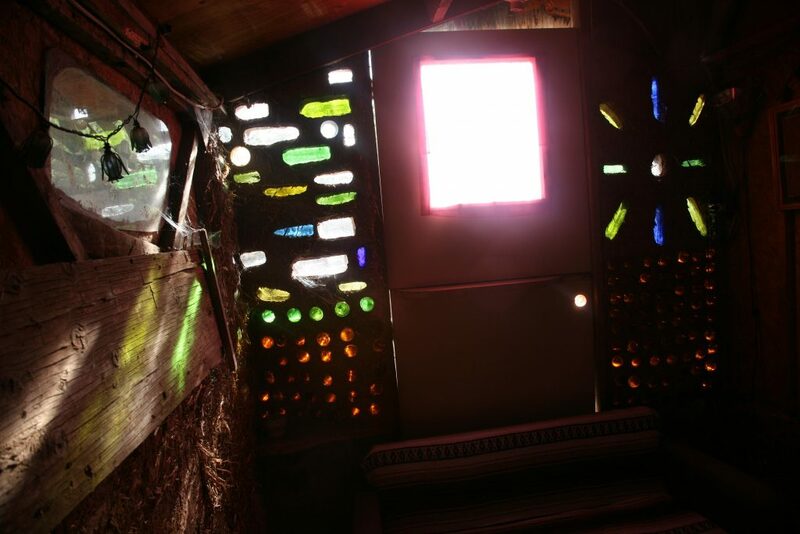 To wash, one goes across the property to the bathhouse, where the solar-heated shower is a length of chopped hose but the windows are stained glass. A small plot with a low fence and a tin roof serves as the outhouse and smells fresher than most New York City restrooms. If a woman wishes to urinate, she finds an AstroTurf-free plot of ground and does so watchfully, given what happened to the dog. After the tour, Ms. Livant sits down in the Hippodome’s kitchen, her daughter perched behind her on the free-form counter, and tells her story. She was 45 years old, married and living in Westport, Conn., when Mr. Kahn came into her life. Her husband was a psychologist named Saul Ader; there were two children, Wendy and Peter. They lived in an 18th-century house and owned a Volvo and a Saab. 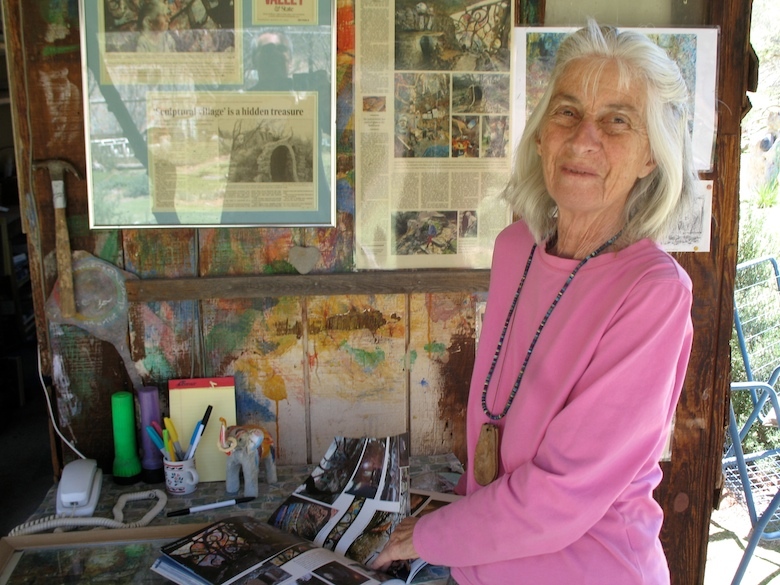 Ms. Livant had an interest in drawing and painting, but busied herself with volunteer work. Then, in 1970, when her daughter was in college and her son was in high school, and the domestic discontent of the ’60s had moved into the suburbs, everything changed. Ms. Livant is still unable to discuss her own work. “The hardships of my psychological life did not outweigh the fact that I was so in love with Michael that I would have and did put up with anything,” she says. 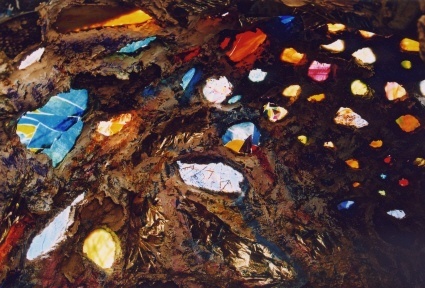 “Cold in winter, not enough food sometimes, on my hands and knees to do housework, when I had paid people to do my housework.” In 1979 the couple came to Sedona, where Mr. Kahn had read that the rocks so inspired Max Ernst. There they met Bob and Joan Crozier, two business people who offered them three acres rent-free. The work on the first structure, which was built into a side of a hill, began immediately — when a friend with a backhoe didn’t show up, Mr. Kahn picked up his shovel and started digging. 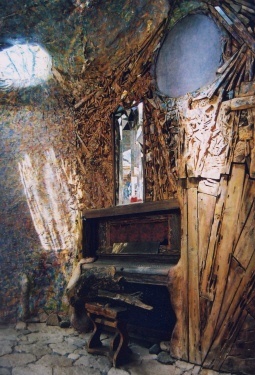 The building would have a piano set into a wall, driftwood sculptures and stained glass. During the five years it took to complete, the couple lived in an 8-by-10-foot shack with a wood-burning stove but no electricity or plumbing, which Mr. Kahn also built. They called it the Winter Palace, and Ms. Livant says it was the best home she has ever lived in. 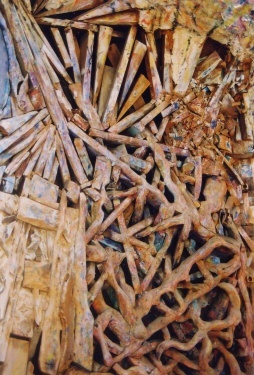 When they were not building, they made art. There was never any money. Occasionally, Mr. Kahn sold a painting. Ms. Livant’s father sent about $50 a month. Ms. Jones recalls sending $40 a month, directly to a supermarket in Sedona; it was the only way to insure it would be used for food, not paint, she says. Mr. Glastonbury admired Mr. Kahn. But he was aware of Mr. Kahn’s limitations as a builder. With money tight, Mr. Kahn had the habit of stretching a bag of cement — instead of using a ratio of four bags of sand to every one of cement, Mr. Kahn would use 8 or 10. In 2004, Mr. Kahn received a diagnosis of frontotemporal dementia, a progressive brain disease similar to Alzheimer’s. But even in the last weeks of his life, when he was reduced to the level of a 3-year-old, Ms. Livant said, Mr. Kahn was drawing, an artist to his bones. Her concern now is for Eliphante. Her landlords, the Croziers, say they plan to deed the property to Eliphante, and they are in agreement about its future: they would like it to be a place to nurture the arts, where there might be performances and workshops, and the buildings would be maintained. But given her age, Ms. Livant says, she would like to have someone to oversee the management of the property. She needs to find a home for her husband’s paintings. And the property is in desperate need of repair. About 10 years ago, in an attempt to get a grant from the Smithsonian, the artists hired an architectural conservator to evaluate the property. The expert calculated that it needed about $28,000 in repairs. They never did get the grant. Check out the gallery of images from “A Handmade Home” via the New York Times. 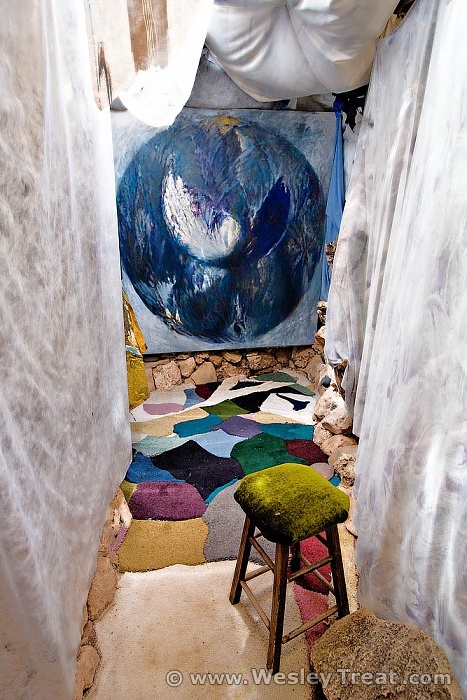 Source: “A Handmade Home” – The New York Times.